I decided to try Brown Chinese Geese to weed my garlic and other garden areas. When rotated through mature crops at appropriate times, they do a good job of that. They also keep some of the grass down around other areas where they range. Except for one male who imprinted on humans, our geese are not friendly. They can actually be pretty obnoxious. If I had small children, I might be worried. But mostly we find their attempts to bully us rather amusing. They hardly ever bite, but they do charge after us some times when we turn our back. If you don’t have a high tolerance for such behavior, I’d look for a mellower goose breed or maybe try a different kind of bird. Brown Chinese Geese are very loud and very talkative. We have eight and cannot hold a conversation when they’re nearby. And although they don’t seem to like us much, they do delight in gathering around us and shouting. They also like to follow me when I’m weeding. Maybe they think I have a secret stash of good sprouts or something. It actually makes weeding entertaining. Our one friendly goose—a male––is charming, particularly during breeding season. He watches for me to come out the door, then runs toward me, crying. He stands close, dips his neck, and honks a lot. He loves having his neck stroked. Goose eggs are great for baking, and we get more than enough from our eight geese. We also tried blowing some out and selling the shells to crafty folk. I’m not sure the labor involved makes that worthwhile financially. If we did our own goose egg art, we might get a better return. 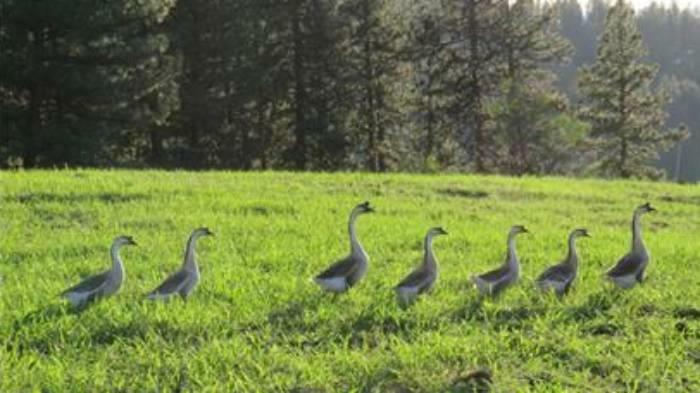 We don’t have any other commercial aspirations for our geese; we just enjoy having them around, despite their loud and cranky ways.